Blank Cartridge is an exhibition of provocative new sculptures by Clovis based-artist Corey Pickett. This series of artworks serves as an appeal for “common-sense” gun laws and the re-evaluation of current gun legislation. Pickett is concerned with the enormous amount of gun violence that takes place on a daily basis and, as a black man, he has a level of fear that is predicated on the current socio-political climate of America and the nation’s gun laws. The premise of his work is to initiate dialogue among the many perspectives related to gun rights with the hope that a reasonable mediation can be reached. His guns are surrogates for the real thing. In addition to being a working artist, Pickett is currently Director of The Jaye Rock Cultural Center in Clovis, NM, which he also founded. He received his Master of Education in 2008 and his Bachelor of Fine Arts in 2000 from Eastern New Mexico University. He will receive his MFA in 2017 from the Vermont College of Fine Art, Vermont. 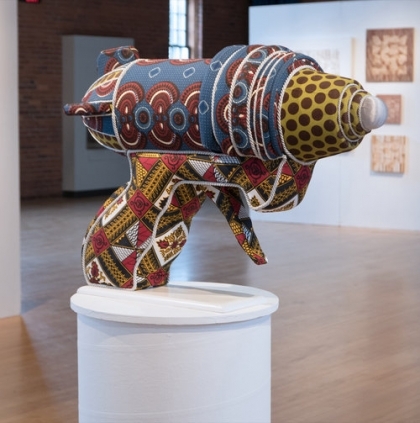 He has exhibited his work in cities throughout the US and is a recipient of the International Sculpture Center’s 2017 Outstanding Student Achievement in Contemporary Sculpture Award.